ESPN.com: MLB - Palmeiro: Hall bound? If Rafael Palmeiro isn't a Hall of Famer, then Tom Hanks isn't an actor, Norah Jones isn't a singer, and Bill Clinton isn't a politician. So as much as I admire my pal, Rob Neyer, why are we even having this debate? I've filled out a lot of Hall of Fame ballots in my day. When it comes time to consider most of the names on those ballots, you ask yourself: Why is this man a Hall of Famer? The more I thought about Palmeiro, though, the more I found myself asking: Why WOULDN'T this man be a Hall of Famer? To be a true Hall of Famer, you need to be three things: dominant, consistent and persistent. In other words, you need to be great. You need to be great for more than just a summer here and there. And you need to be great over a long period of time. Well, this guy qualifies on every count. He has hit 38 home runs for eight straight seasons. And maybe that doesn't seem like so many anymore, in an era when hitting 60 might not even lead the league. But if it's so easy, how come no one else has done it eight straight years? Not Barry. Not Sammy. Not Junior. Not Bagwell. Not Piazza. No active player has done it. No player in history has ever done it. Which would fit anybody's definition of "hard to do." Remember, the year Palmeiro first appeared in the big leagues, with the '86 Cubs, nobody in the National League hit 38 homers all season. And that was ONE season, not eight. But OK, we'll concede that 38 is an arbitrary number. So if we drop the bar to 30, Palmeiro's eight straight 30-homer seasons are still topped by only five players in history -- four Hall of Famers (Jimmie Foxx, Lou Gehrig, Eddie Mathews and Mike Schmidt) and a future Hall of Famer (Barry Bonds). Except Palmeiro also has eight straight years of 30 homers AND 100 RBI. Only Foxx (12) and Gehrig (9) top that. But wait. Off in the distance, we can hear Neyer trying to argue that, "Big deal, 100 RBI doesn't necessarily define you as a great run-producer anymore." Well, how about 120? Palmeiro knocked in 120 four years in a row ('98 through 2001). No left-handed hitter had had a longer streak than that since Gehrig. All right, so maybe using "streaks" is way too convenient, too -- since I get to pick whatever streaks I want to use to support my brilliant case. But I think I can argue that Rafael Palmeiro has been a great hitter in every conceivable way, over any conceivable period of time you -- or Neyer -- want to choose. We're talking about a guy who has had a 203-hit season, a 148-RBI season, a 124-run season, a 49-double-season, two 47-homer seasons, a .630 slugging season, a .420 on-base season, even a 22-steal season. Neyer can argue, correctly, that he hasn't led his league much (hits once, runs once, doubles once). But he finished second (not eighth, not 12th, not 17th) in homers, RBI, batting, slugging, extra-base hits and OPS. And I've always felt as if it's never a guy's fault if his best seasons happen to fall in the same year somebody else's best season happened to be a tick higher. Heck, it's not as if you never find this man among the league leaders. He has been in the top five in homers five times, in extra-base hits seven times, in hits three times, in RBI twice, in slugging three times, in intentional walks (a clear sign of respect) four times, in the batting race twice. And once you stretch the bar over any length of time, you find this is a guy who consistently repeats his excellence. Over the last 10 years, only Sosa has more RBI. Only Sosa and Bonds have hit more homers. Only Robbie Alomar, Bernie Williams and Craig Biggio have more hits. Or let's consider Palmeiro's 15-year career as a full-time player. Only Bonds has driven in more runs since '88. Only Bonds and Sosa have hit more home runs. Only Bonds has more extra-base hits. Nobody has more hits. Well, 15 years is a long, long time to be that good. That's how Eddie Murray got into the Hall of Fame, right? By being really good for a long time? Well, in Murray's best season, he hit 33 home runs. Over Palmeiro's career, he has averaged 33 home runs. For 15 years. And one reason for Palmeiro's dependability is his durability. In the last 12 seasons, he has missed a total of 32 games. He has never played fewer than 152 games in any full season since he got to the big leagues. Oh sure, he has had the DH to help him. But that isn't his fault. And the truth is, he has spent less time as a DH than many people think. Only twice since 1989, when he first went to the American League, has he failed to play at least 100 games while wearing a first-base mitt. Which he has used to win three Gold Gloves, by the way. Palmeiro also has some of the quirkiest Hall of Fame credentials of modern times. And we love that about him. He did, somehow, become the only man who ever won -- or ever will win -- a Gold Glove and a DH of the Year award in the same season (1999). He's also, remember, the all-time home-run champ among players whose last names start with the letter, "P." Read it and weep, Boog Powell. So I'm the first to acknowledge that there will come a time when just hitting 500 home runs will not be enough to automatically whoosh a player into the Hall of Fame. But sorry, Rob. That time isn't now. And that player sure isn't Rafael Palmeiro. I'm not an idiot. Or maybe I am. 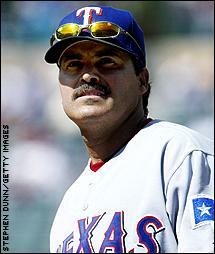 Either way, though, I do know that Rafael Palmeiro is a great player. A Hall of Famer, though? It depends on whether or not you think Cooperstown should be overrun by first basemen, and it depends on whether you think the Hall of Fame should be reserved for great players, or for great players. There already are 21 first basemen in the Hall of Fame (including Ernie Banks, who played more games at first base than shortstop, and Rod Carew, who played more games at first base than second). Meanwhile, there are 15 second basemen in the Hall, and only 11 third basemen. I'm not suggesting that electors should strive for equivalency among positions, but does it really make sense to have twice as many first basemen as third basemen? Isn't it likely that we've probably been overvaluing first basemen and undervaluing third basemen? So if we're going to elect yet another first baseman to the Hall of Fame, shouldn't we start with the best first baseman who's not already in? And so instead of looking at Palmeiro's career in a vacuum, shouldn't we also look at Palmeiro's contemporaries, and try to figure out if he's the best, or at least close to the best, among them? It's pretty clear that Palmeiro isn't the best first baseman in the game today, and probably hasn't ever been. Over the last decade, Palmeiro ranks behind Jeff Bagwell, Frank Thomas, Jason Giambi, Jim Thome, and perhaps Todd Helton. Bagwell's finished in the top 10 in voting for the NL MVP six times, including first-, second-, and third-place finishes. Thomas has finished in the top 10 in voting for the AL MVP eight times, including two first-, one second-, and two third-place finishes. Giambi hasn't been around for long, but he already has an MVP award and a second-place showing. Meanwhile, Palmeiro has finished among the top 10 in MVP balloting three times: in 1993, he finished eighth; in 1996, sixth; and in 1999, fifth. Why hasn't Palmeiro even sniffed an MVP award? Sure, it's partly because he hasn't played for the right teams at the right time. But mostly it's because while Palmeiro has obviously been a great hitter for a long time, there have been a lot of great hitters -- or rather, there have been a lot of great numbers -- in recent years. How many great seasons has Palmeiro enjoyed, relative to his peers? He has, in his long career, led his league in a hitting category three times. In 1990, he led the American League with 191 hits. In 1991, he led the American League with 49 doubles. And in 1993, he led the American League with 124 runs. In none of those seasons could he, by any stretch of the imagination, have been considered the best hitter in the American League. As a hitter, Palmeiro's best season was probably 1999, when he placed fifth (his best finish ever) in the MVP balloting, and ranked second in the league with a .630 slugging percentage, second with 47 home runs, second with 148 RBI, and ninth with a .391 on-base percentage. Even with all that, Palmeiro wasn't the best hitter in the league (that was Manny Ramirez), nor was he among the top three players (in addition to Ramirez, Roberto Alomar and Derek Jeter were both better than Palmeiro, and Bernie Williams, Nomar Garciaparra, and Ken Griffey were just as good). Look at the hitters in the Hall of Fame (or at least the hitters in the Hall of Fame who deserve to be in the Hall of Fame). The great majority of them could claim, for at least a season or two, to rank among the very best players in their league. Or, at the very least, to consistently rank among the very best players at their position. But it's hard to convincingly argue that Palmeiro has generally ranked among the game's best players, or even among the game's very best first basemen. And you know what? I haven't even mentioned Fred McGriff, whose career numbers are strikingly similar to Palmeiro's. If you're going to vote for Palmeiro, then you have to vote for McGriff (and his six top-10 MVP finishes). Along with Bagwell and Thomas and Thome and (maybe) Giambi and Helton. 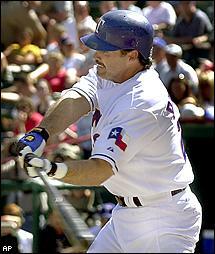 Perhaps Rafael Palmeiro belongs in the Hall of Fame. But let's give this a few years, and look at his career in the context of other great first basemen of the late 20th and early 21st century. Because if he's only the sixth- or seventh-best first baseman of his era, he doesn't belong in the Hall. The PTI crew debate Rafael Palmeiro's Hall of Fame credentials. Tony Kornheiser Show: Joe Morgan and Tony discuss the degree to which hitting 500 homers has become easier. The Baseball Show: Rafael Palmeiro's quest for home run No. 500 was not helped by getting plunked May 3.